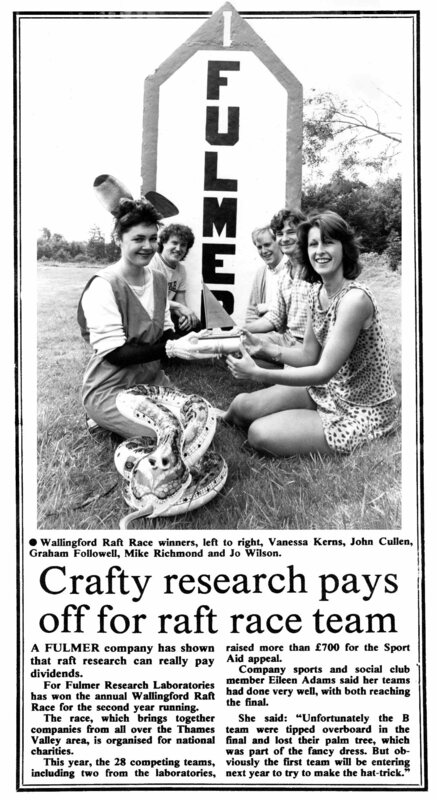 In the summer of 1984 the younger (and fitter) staff from the Stoke Poges site of Fulmer Institute entered two teams for the Wallingford Raft Race. 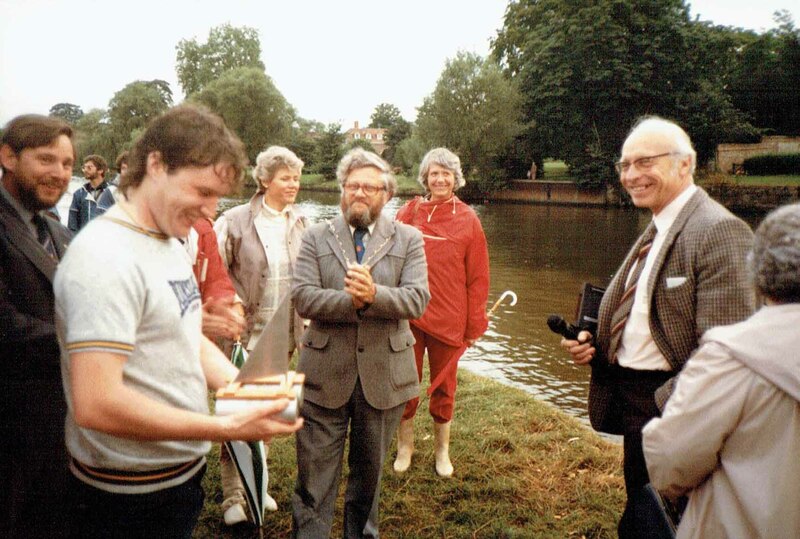 The race, which was for home-made craft with crews in fancy dress, started upstream from the four arched, stone Wallingford Bridge and finished at the Riverside Meadows, passing under the bridge. An additional requirement was that the crews, that had to include two women, had to go through one of the tyres hung from the bridge. Prizes were awarded for the fastest raft, and the best fancy dress. In their own words, the crews were totally unprepared for the experience. The rafts had been constructed from what ever could be found lying around the Fulmer site (ladders, oil drums and the roof rack from the minibus) and anything else that could be scavenge for free, including old car-tyre inner tubes. Although the rafts did at least float, that was as good as it got. Both craft were so heavy that it was almost impossible to manoeuvre them or generate any speed, and they finished towards the end of the field. As a consequence their crews were sitting targets for projectiles thrown from other rafts. John Cullen suffered a direct hit from a paper bag filled with maggots, and had to jump into the river in order to remove them as quickly as possible. 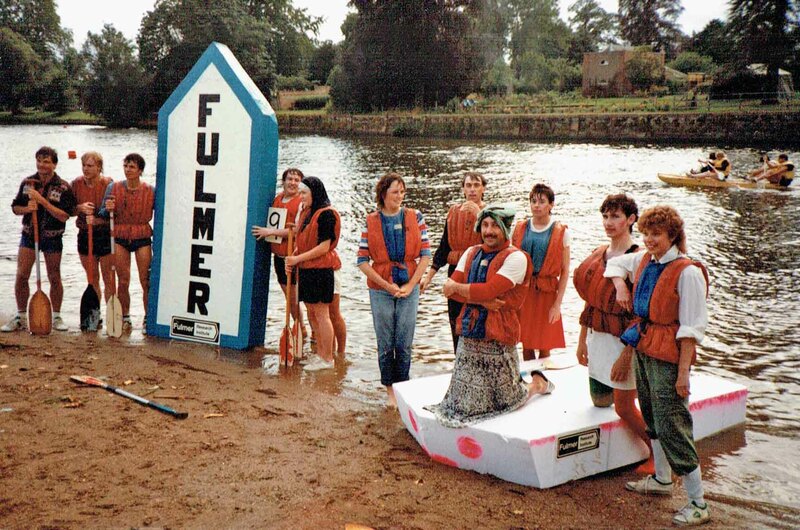 The following year two crews from Fulmer again took part in the raft race. This time however, after careful appraisal of what had gone wrong previously, they modified not only the design of the rafts, but also the tactics to be employed. Two new rafts were constructed from 4’ x 8’ x 1’ expanded polystyrene blocks, with a laminated layer of J-cloths and paint on the outside to stop the polystyrene breaking away and polluting the river. 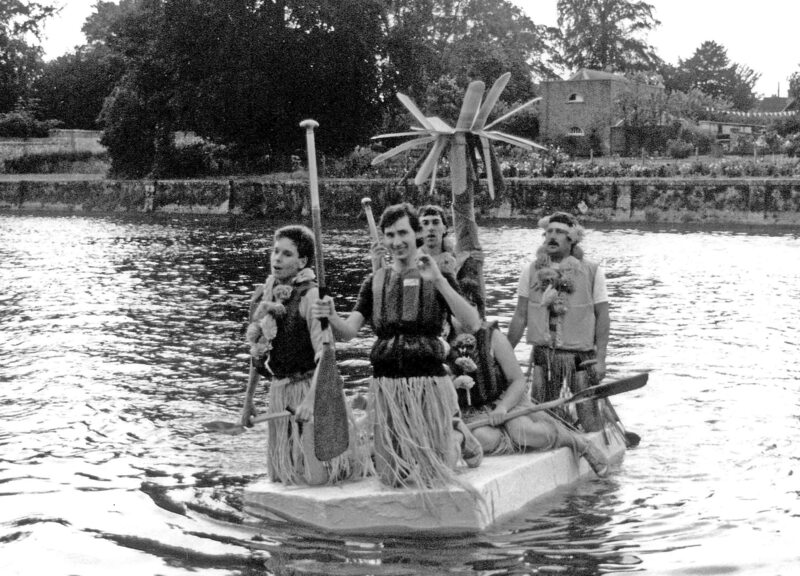 Raft #1 was the fast craft with the strongest team captained by John Cullen, whilst Raft #2 was the fancy dress craft that was fully armed with a 4 gallon bucket of goo, handfuls of which could be thrown at opposition rafts (note – the goo was fully biodegradable, made from a mix of gelatine, water, flour, custard powder and green food colouring). Raft #2 also had the responsibility of causing as much trouble at the start to allow Raft #1 a clean get away ahead of the rest of the field. The redesign of the rafts, combined with the change of tactics resulted in a complete change of fortune. Fulmer Research Raft #1 finished first and in addition Raft #2 won the fancy dress as well as finishing in a respectable position. In 1986 Fulmer Institue won for a second time, and followed it up in 1987 completing a hat-trick of wins.